The experts at Capital Coating, Inc. have been repairing rubber roofs in the Dundalk, MD, area and surrounding communities for 20+ years. Rubber, or EPDM, roofs are a popular choice among commercial and industrial building owners due to their cost-effectiveness and durability. Unfortunately, they also come with their own list of problems, too. If your commercial rubber roof is in need of repair, call the qualified, friendly professionals at Capital Coating, Inc. We are equipped to inspect, diagnose, and repair any issue your rubber roof may have, no matter the size or difficulty. Call today for a free estimate at (717) 442-0979. If you suspect your rubber roof may need repairs, our certified team members can do an on-site visit to inspect and evaluate it. We are committed to ensuring that our customers receive fast, quality care, and to that end, we begin every job with a thorough inspection to verify the necessity of the repairs as well as the number and type of repairs needed. Once we inspect your roof, we present a detailed report on your roof, along with a custom plan to fix any and all problems the evaluation may have turned up. We also offer a free, no-obligation cost estimate of all repairs. This ensures that everyone is on the same page before any work ever begins. Trapped moisture – Low spots in the roofing membrane are hot spots for standing water, as are bubbles or blisters between the roof layers. Accumulated debris – Due to their nearly nonexistent slope, flat rubber roofs are notorious for accumulating dirt, leaves, and other organic matter and trash, which can compromise their ability to drain. 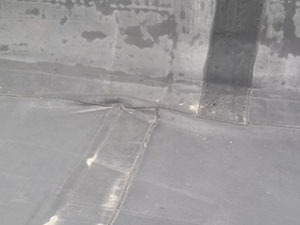 Membrane shrinkage – Whether fully-adhered or mechanically adhered, rubber roof membranes are prone to shrinking in fluctuating temperatures, placing dangerous strain on the underlying roof structure. Growing vegetation – Rubber is a favorite place for moss, algae, and even grass to find temporary purchase, which can damage the material and open the roof up to water. 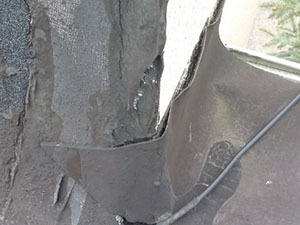 Storm damage/foot traffic damage – Excessive or careless foot traffic can prematurely age and weather your rubber roof, as can projectiles from stormy weather – falling branches, for instance. Capital Coating is committed to providing unsurpassed customer service and the highest quality workmanship available to residents and property owners in the Dundalk, MD, area. If you are in need of rubber roof repair, please call us today at (717) 442-0979.